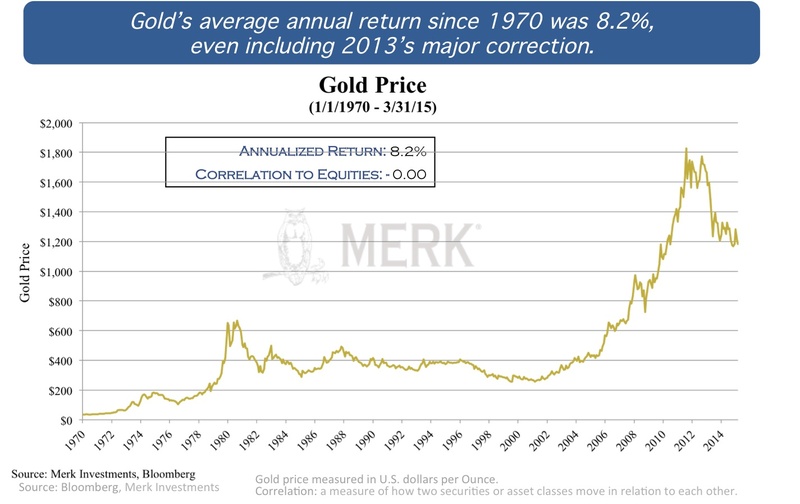 Merk Insights - What's next for Gold? Will gold zoom higher with Greece on the brink of default? 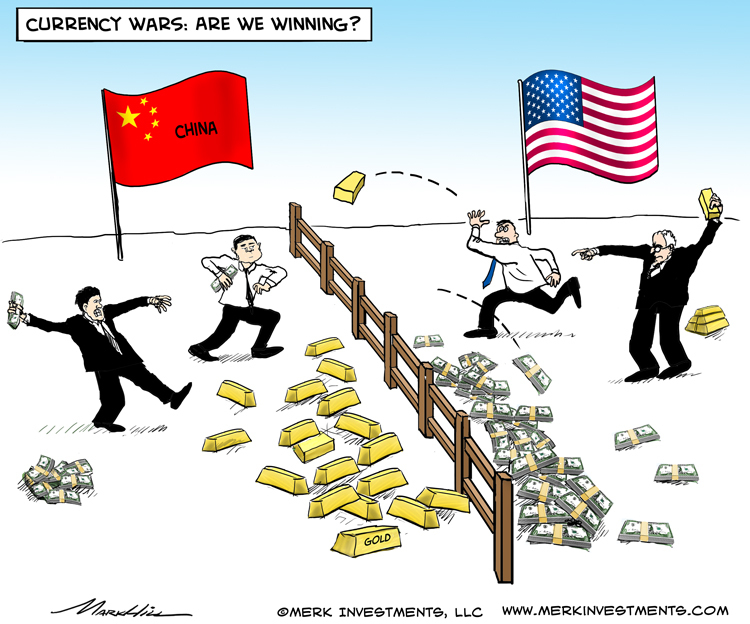 Or will it crash as the Fed pursues an “exit?” Why has gold not rallied with the recent retreat of the dollar? To understand where gold may be heading, keep in mind that this shiny metal isn’t changing; it’s the world around it that is. We contemplate why investors may want to hold gold as part of their portfolio. Gold’s chemical characteristics make it a formidable store of value because it doesn’t change, doesn’t deteriorate over time. More so, because gold is rare, a lot of value can be stored in a small space: A "London Bar" - to the layman only known from James Bond or other movies, weighs about 400 troy ounces and is worth about half a million dollars. And gold is fungible and can be broken down into smaller pieces, such as minted into coins or smaller bars. As such, gold is suitable as a medium of exchange. With the advent of fiat currency, many have said gold’s golden days are over because it is more cost effective to electronically wire money across the globe than to ship gold. There is also an electronic market for gold, although it is dominated by institutions with only a few firms offering consumers the ability to exchange gold electronically. Indeed, we are concerned many currencies, not just the U.S. dollar, are at risk of losing their store of value. 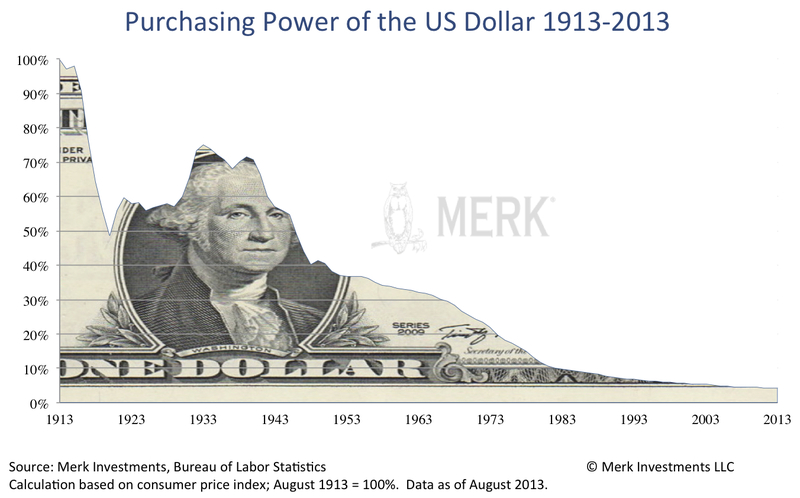 A key reason why cash is not good at preserving purchasing power is the government issuing it has lots of debt: a government in debt has an incentive to debase the purchasing power of its currency. This isn’t just a criticism of the U.S. government, but governments in general. What’s different about gold is that governments can’t “print” it. Many agree that cash might not be good at preserving purchasing power, but that one should be investing in productive companies instead, but was that a good idea in 1929 or 2000? Severe declines followed those stock market peaks. Someone arguing that regardless of those painful periods of stock market declines, stocks are a good long-term investment; many refer to such a person as a prudent long-term investor. Another person making the argument gold has fared well in the long-run is shrugged off as a gold bug. Talking about prudent investors, most investment advisers don’t advocate putting all of one’s money into the stock market. Instead, they preach diversification. Except that, I would argue, textbook diversification may not work in an environment where most asset prices might be elevated. Central banks around the world, in our analysis, have compressed risk premia, meaning risky assets don’t appear particularly risky anymore, as evidenced by low volatility in the equity markets or low yields in the junk bond market. I hear stories about shifting from one sector in the equity market to another, as that other sector may perform better in a rising rates environment. That may well be, but if both equities and bonds were to plunge, is it sufficient consolidation to lose less money by being slightly better positioned? cash may not be safe in the sense that purchasing power is at risk. As the chart above shows, the price of gold clearly does not always go up. When all is said and done, however, the annualized return from 1970 until the end of March this year was 8.2% per annum, while exhibiting a correlation to equities (the S&P 500 Index) of zero. Whether there is an expectation of a positive return. If both of these conditions are met, one can start discussing how much to add to a portfolio. With regard to correlation, we think gold is a candidate investors may want to consider, especially in an environment where many other asset classes are highly correlated. An important reason for this low correlation may be the low industrial use of gold. While jewelry demand may give gold a bit of cyclicality, the low general industrial use may be a key driver why the price of gold has such a low correlation to stocks and many other asset classes. What about the other aspect: positive returns. How is it possible that gold, this piece of metal that’s not productive, that it has had its price increase by an average of over 8% per annum? The results for long periods tends to outstrip inflation. There may be many drivers, but the simplest answer may well be that published inflation numbers under-state actual inflation. Other possible answers include increased demand (partially due to global population growth, if nothing else) while increasing supply isn’t that easy. In some ways, this may be irrelevant, because the real question is what will happen to the price of gold going forward. What is intriguing about gold is that many acknowledge gold has been a good investment in the past, but going forward, they don’t think it’s going to rise in value. And that’s where we can finally turn to the current environment. The reason I’m a bit skeptical about Greece driving gold higher is because I don't think Greece drives the markets all that much these days. With many warnings about a Greek default one would think that the market has had time to prepare for it. Outside of Greece, the fear of “contagion” as a result of Greek default is limited these days because financial institutions have had years to prepare for a Greek default. Much of Greek debt is now held by the International Monetary Fund (IMF); as well as the European Central Bank (ECB) and European Union. In our assessment, losses on Greek debt won’t wreck the financial system, likely not even any financial institution, as losses have been “socialized.” This socialization of losses is foremost a political problem. I don’t rule out that the price of gold may be affected, but it may be difficult to devise a profitable gold investment strategy purely based on Greece. A longer-term strategy buying gold in anticipation that more debt might be monetized may be more worth considering. 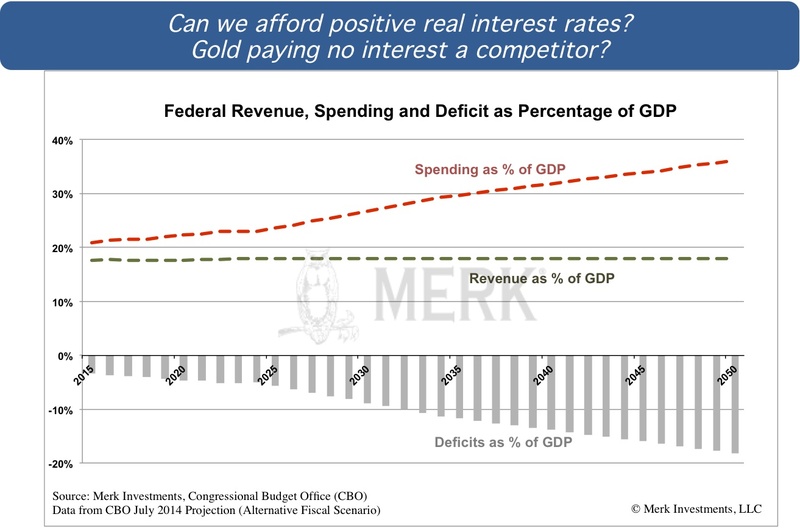 Although we think this belongs in the long-term bucket, a similar bucket as is required for dealing with long-term entitlement issues in the U.S.
To me, the below chart is one of the most compelling arguments why, going forward, gold may be no worse an investment than in the past. We don’t know where the price of gold is going to be tomorrow, but we have made promises in the U.S., just as in much of the developed world - that may be difficult to keep. The temptation to debase the purchasing power of the debt is great. In plain English, we believe the Fed will be behind the curve. Bill Gross calls for a “new normal” that may see interest rates top out at 2%. Our question is: where will inflation be if interest rates top out? To continue this discussion, please register to join us for our “What’s next for the dollar, gold & currencies?” webinar on Thursday, May 14. Next week, we will be providing out outlook for gold; if you haven’t already done so, ensure you don’t miss it by signing up to receive Merk Insights. If you believe this analysis might be of value to your friends, please share it with them.